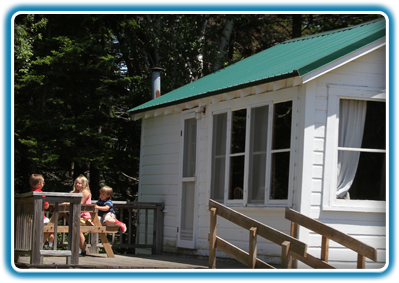 We rent 14 cottages on a weekly basis – Saturday to Saturday, beginning in June and running to September. Rustic in nature, all cottages are fully equipped with cooking and eating utensils, an apartment sized cook stove and refrigerator. Baths include full fixtures with a standard upright shower stall. All cottages have wall mounted electric heat. All beds are double in size. Pillows are provided, but you will need to bring bed linens (fitted sheets and pillow slips), blankets and towels. Each cottage has a deck, small lawn, parking area and its own unique view of Casco Bay. All guests have free access to our privately owned beach which is within walking distance. We have one and two bedroom cottages available, and reservations are taken up to a year in advance. Please call or email us if you would like information on seasonal site rental.